These are great towels for everyday use and the beach for a quick dry. Stylish and large enough for beach and pool. Thin enough to pack lightly for the beach or water park. This ultra-soft and extremely absorbent Authentic Pestamel Fouta towel wrap is made from natural cotton hand-woven on ancient looms in Turkey. 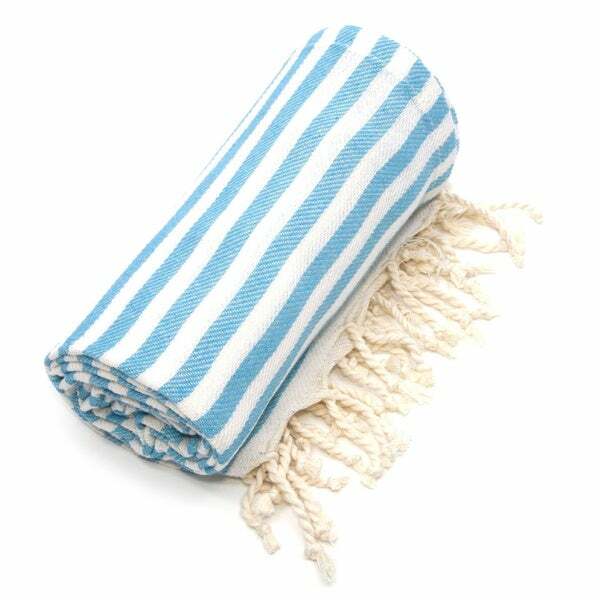 The herringbone weave Fouta towel is lightweight and very generously sized. Use these multipurpose towels anywhere - in the bathroom, on the beach, in the dining room and even as a shawl. The stylish turquoise blue striped pattern fits many household themes. These towels become softer and more absorbent following each wash. Place the towel in the machine for easy cleaning, and use low heat to dry it. I bought three of these in different colors. They are absorbent and generously sized. They dry quickly and hold up to washing and drying quite well. A good purchase. Love my new Turkish towel. It's comfortable enough to wrap around you for warmth and nice to dry off with as well as dry you off. great size for the beach! lightweight, not like a towel, but big enough to lay on. also very nice to tie around your waist over your suit! color is nice and bright. Love the style--thin for easy travel and dry time but enough for laying on the beach and a quick dry. I bought 2 towels...one was heavyweight, the other lightweight. The lightweight one did not shrink much, but the heavyweight one shrank a LOT. It now won't fit on a pool lounger chair. I was planning to buy a couple more but will not now. After one wash, these towels shriveled up! Yes, they are thin as described, but the quality of the fabric and tassels is so poor that they don't even hold up to one gentle wash. Perfect for me. I Wanted a light throw covering for lounge chairs.